London Tube passengers will soon be able to use their mobile phones in underground tunnels as part of plans to be announced after the election. Commuters can currently use their phones at station concourses and platforms but not in tunnels. 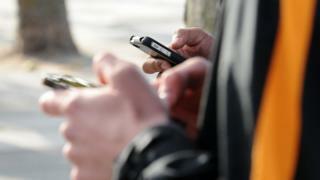 London lags behind other major capitals for mobile phone coverage on its transport network. Metro passengers in Paris, New York, Berlin, Seoul and Tokyo have enjoyed wi-fi services for several years. Eliminating so-called "not spots" in Tube tunnels was among London Mayor Sadiq Khan's manifesto pledges during last year's race for City Hall. The BBC understands Transport for London (TfL) and Mr Khan will invite telecoms firms to bid to build the infrastructure to provide Underground 4G wi-fi coverage next month. London Underground is one of the most high profile "not spots" in the country, and the mayor is understood to be keen to improve connectivity across the capital. Anyone who has travelled on the London Underground recently will be familiar with the scene inside a packed carriage - passengers sitting or standing in silence, glued to their smartphones. This was the case even before Virgin Media built a wireless network which allows internet connectivity on the platform, if not on the trains. But imagine how much more intense the screen addiction would become if 4G came to the Tube? I first saw people phoning from underground in Seoul in South Korea more than a decade ago, so mobile connectivity has been a long time coming to London. But maybe it's already too late - who uses their mobile to make calls any more? And if you do take a call on the tube, be prepared for some very heavy tutting. Companies that may be interested in bidding include Virgin Media, which has already built the wi-fi infrastructure for Tube station concourses and platforms. Others include BT, owner of mobile phone network EE - which boasts that it has the strongest wi-fi access on Tube platforms already - and Openreach, which already runs the UK's broadband infrastructure. Another firm likely to be interested in bidding for the contract is Australian telecoms company BAI Communications, which has recently opened offices in London and announced plans tor European expansion. BAI Communications has previously stated its UK operation's "main priority is the delivery of advanced wireless services to large-scale transport networks, improving cost and operational outcomes for the operators". City Hall insiders said some details of the tender process were still being worked out. It is unclear whether advertising would be something commuters might have to tolerate for the luxury of enhanced wi-fi access. A TfL spokesperson said: "We are keen to offer full mobile phone coverage for our customers. The introduction of this would need to be commercially viable and would follow engagement with staff and customers."